North Carolina's softwood and hardwood lumber production, consumption, and revenue trends were recently published for a 16 year time series. In 2013 (the most recent year of available data), the 2.26 billion board feet of lumber produced by sawmills in the state had a market value of $1.02 billion. 2013 also marked the first year since 2006 that inflation-adjusted lumber revenues exceeded $1.0 billion. There is additional value, though, in the state’s lumber that is not currently being realized- its carbon value. Establishing carbon’s market value has gone through fits and starts, and that effort is still in its early stages. The Regional Greenhouse Gas Initiative (RGGI) was the first mandatory market-based program begun to reduce emissions of carbon dioxide. Nine states along the east coast participate in the initiative- Connecticut, Delaware, Maryland, Massachusetts, New Hampshire, New York, Rhode Island, and Vermont. The RGGI is aimed specifically at reducing the CO2 emissions of the power sector. A limited number of tradeable CO2 allowances are made available at quarterly auctions, which began in 2008. Bids are submitted confidentially for a specific quantity of allowances at different prices. Winning bids receive the specified quantity of allowances. Allowances may also be purchased in the secondary market, such as the Intercontinental Exchange. Establishing the value for a CO2 allowance via auction provides a mechanism to drive long-term investment to improve efficiencies and develop cleaner technologies. This works to both save consumers money and create jobs. On the west coast the California Air Resources Board began a carbon allowance auctioning program in late 2012 under its “California Cap and Trade Program.” California’s Cap and Trade Program regulates a number of industries, including the pulp and paper industry but currently not wood products manufacturers. This program has evolved to what is now the California Carbon Allowance Vintage futures contract traded on the Intercontinental Exchange. How Much Carbon Did North Carolina's Lumber Production Store? The carbon contained in North Carolina’s 2013 lumber product was determined by converting board footage of production to bone dry tons. The lumber was initially assumed to be at 15% moisture content (dry basis) per U.S. Forest Service conversion factors. Fifty percent of the bone dry wood weight was then considered as carbon. 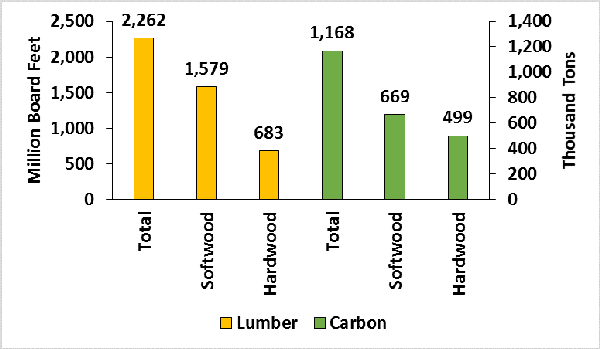 By this measure, nearly 1.17 million tons of carbon were stored in North Carolina’s 2013 lumber product (Figure 1). Figure 1. North Carolina 2013 lumber product and tons of carbon stored. What Is Lumber's Carbon Product Value? To provide one estimate, the RGGI clearing price was averaged over the 2013 calendar year and converted from $ per ton CO2 to $ per ton C. This resulted in a mean price of $10.68 per ton C. The allowances averaged $2.91 per ton CO2 at auction over the year, and carbon’s mass is 27.3% of CO2’s total. The carbon product value was then determined by multiplication. 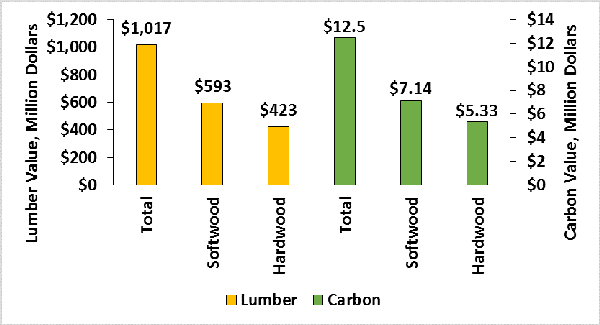 Figure 2 provides the lumber product value in 2013 along with the value of the carbon stored by the lumber. The carbon product value of North Carolina’s lumber totaled $12.5 million in 2013. The carbon stored in softwood lumber had a market value of $7.14 million, while the carbon contained in hardwood lumber amounted to $5.33 million. Note there is no one set standard for arriving at a carbon valuation. Social cost (economic cost to society), observed transactions prices via market trading, and regulatory permit values for CO2 emissions are three means of value assessment. Varying unit prices and product values will result across methodologies and data sources. On a per ton C basis, the 2013 average RGGI price was much lower, about one-fifth, than an equivalent California Carbon Allowance Vintage futures contract. Thus, the carbon product value arrived at in this note is likely a conservative estimation for the lumber manufactured in North Carolina. Figure 2. North Carolina lumber and carbon product values, 2013 dollars. Lumber’s value as a carbon storehouse amounted to $12.5 million, or 1.2% of the revenues received by North Carolina mills in 2013 - dollars not currently being captured by manufacturers in the marketplace. Based on these estimates, lumber’s carbon product value surpassed the gate value of approximately one dozen agricultural commodities in the state. Recall this is only a snapshot of lumber’s carbon product value and does not include other solid and composite wood products. A cumulative forest-based carbon product valuation could rival the economic contributions of some of North Carolina’s chief farm and forest products. We are continuing to better understand and quantify (even monetize) the non-market ecosystem services our forests provide, including the value of accumulated and stored carbon. Information on the environmental benefits forest products like lumber provide may encourage consumers to further consider sustainable materials in their purchasing. McConnell, T.E. 2016. North Carolina lumber production, consumption, and revenue trends, 1998 to 2013. N.C. Cooperative Extension factsheet AG-816. Raleigh, NC. Regional Greenhouse Gas Initiative. 2016.